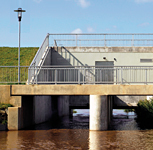 In general, shafts within drinking water and waste water systems are totally unprotected against unwanted access. The same goes for cable ducts. Thus, damage, theft or vandalism may occur. In areas which are particularly endangered in respect of the aforesaid manipulation, such as concert halls, sports stadiums, airports or government buildings, free access to shafts and ducts poses an extreme safety hazard. 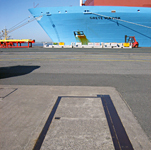 Until now, sealing covers by welding or marking them with stickers - and have them controlled more frequently - are the foremost applied safety measures. These not only are onerous but also cannot be considered effective methods of shaft protection. ZERBERUS provides protection to sensible areas around the clock against theft, vandalism, terrorist attacks, sabotage and espionage. Reliable protection: ZERBERUS dependantly prevents unauthorized entry to security-sensible areas. Variable systems: ZERBERUS can be combined with other safety systems and thus can be adapted flexibly to different demands of protection. 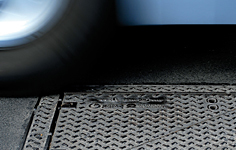 Easy installation: ZERBERUS safety locking devices can be used with all kinds of access covers, gratings, cable duct covers and street gullies - without disrupting the flow of work at point of installation, as the complete, existing cover/grating gets exchanged against a unit containing the fully mounted ZERBERUS mechatronic safety locking mechanism. Convenient operation and connection: ZERBERUS is easy to operate as it has merely two kinds of status information (open/closed). It can be connected to the AMERIS shaft status control system; the ZERBERUS locking status (open/closed) is indicated separatly, however. ZERBERUS adapts without problem to any kind of safety demand: from simple, mechanical locking device to highly sophisticated cableless mechatronic safety device.